Looking like Ghost Week here, I suppose. I’ve mentioned this many times, but chocolate-on-a-stick is one of my favorite go-to, crafty treats. 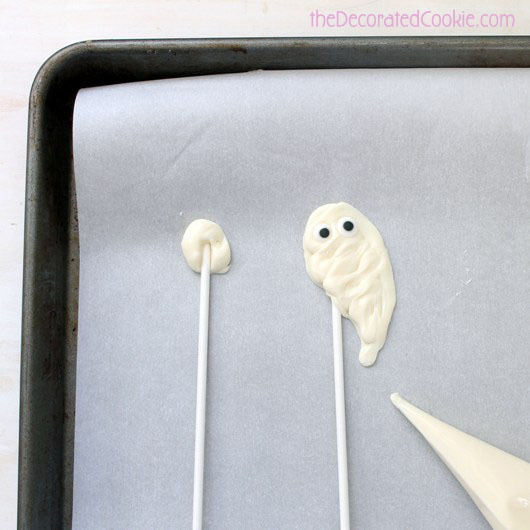 Melt chocolate chips or colorful candy melts in a disposable decorating bag, snip the tip, and pipe on lollipop sticks. That’s it. You can create any design, add sprinkles, coconut, nuts, whatever. And best of all, kids can do this, too. 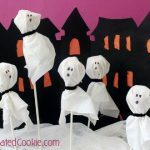 I always have these supplies on hand, so I’ve pulled this out for a last minute craft when kids come over. 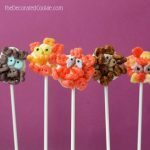 For Halloween, I’ve made spider pops before. 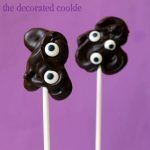 And I’ve done bats and spider legs for Oreo Cakester pops. 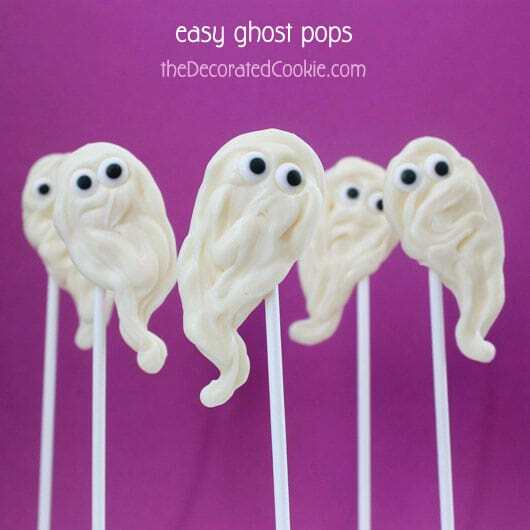 I’m not sure why it took so long to make ghosts. These take mere minutes to make. 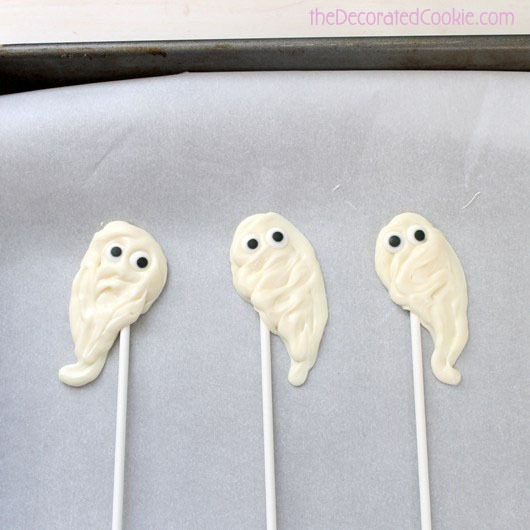 How to make chocolate ghost pops. *Find all of the above in the craft store, or, see below for amazon links. 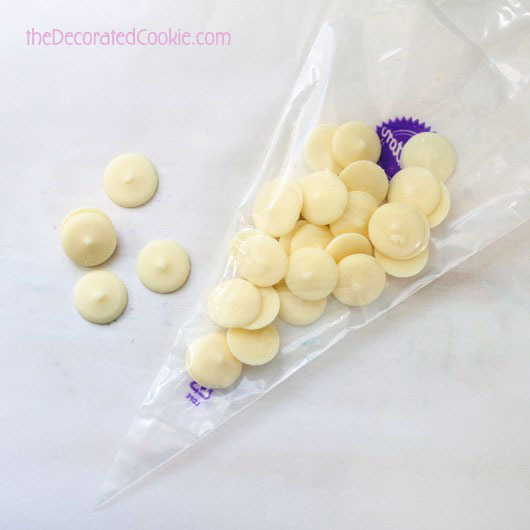 Line a baking tray or trays with wax paper and set aside. Snip 1/2 inch from the tip of the decorating bag. Pipe a dot on the tray and place a lollipop stick on top. 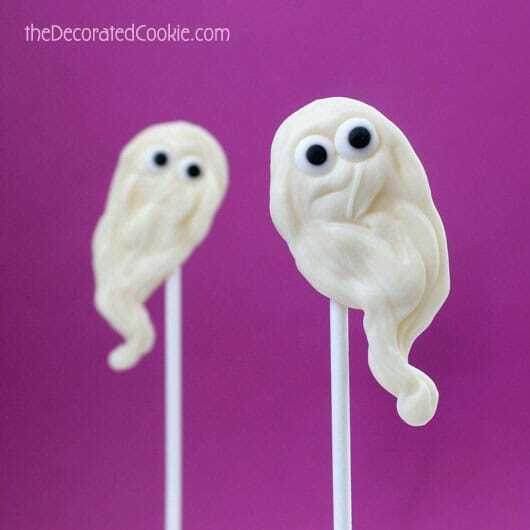 On top of the dot, pipe a ghost and immediately add two candy eyes. Fill the tray(s) and let the ghosts sit a good hour to set. These are absolutely adorable! I am running out to get the eyes pronto. 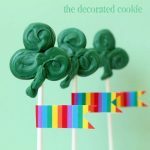 I saw them last week and was just waiting for the perfect treat to use them on! 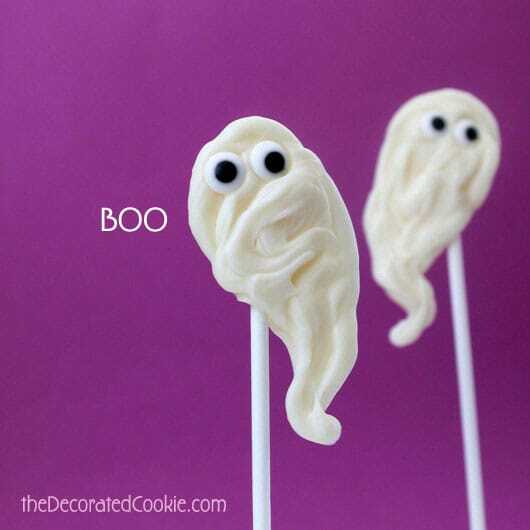 This kind of cute and easy food craft is what first reeled me into your blog and then I was hooked! Love them, Meaghan!